Wearable technology decorated with precious stones. The functionality allows the top cover designed in a thousand ways, which can be seen from the recent collaboration between Moodmetric and jewelry designer Tina Tillander, who was keen to combine precious stones with the original design. The mind and body wear down when constantly activated by the emotional loads of everyday life. The Moodmetric ring is a smart jewelry to follow stress levels and learn to take a moment to calm down when needed. We are all dealing with the stress, some less, some more - more or less every day. The obvious question arises easily, how much more can I do and achieve, before the stress turns against me? “Moodmetric services are aimed at high performing individuals, who want to optimize the use of their emotional capacity. Persons demanding a lot from themselves want to know where their personal limits are. The Moodmetric ring is a simple, yet beautiful tool to measure long term data about how emotional load is affecting the wearers’ sympathetic nervous system”, explains Niina Venho, CEO of Moodmetric. The Moodmetric app includes real-time follow-up on stress levels which gives an instant view to reactions and stress amount during the day and helps the wearer to gain the needed recovery during the day and with enough sleep in the night. Successful people have high emotional intelligence. They are aware of themselves and understand how it would feel to be in the shoes of someone else. Self-awareness is the first step in growing emotional intelligence. How do I feel, how do I behave, what evokes emotions in me? Learning to calm down in a hectic situation and seeing the people behind the matters in hand are valuable tools for a manager. “Managing stress also requires strong understanding of self and own reactions. Reducing stress starts from personal insight – and having measured data is often a good wakeup call”, Venho points out. The Moodmetric service for organizations is available for companies keen to support their employees´ emotional health. The individual is in the focus, and the program is built on personal interest of the program participants. It’s not a big secret - spending time in nature is relaxing and stress relieving. In Espoo, nature is always close by. Wellness travel is an increasing trend and Espoo Innovation Garden is a fruitful soil to meet the demands of both constantly increasing amount of individuals seeking for an optimum level of performance and on the other hand, conscious travelers looking for a stress-free, close to nature break from daily life - and yet to get measureable proofs and results of their stay. Cooperation with local tourism service providers in Nuuksio has already started. 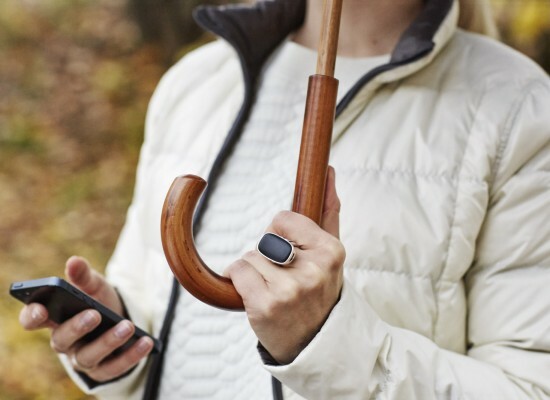 The Moodmetric Ring was invented in Espoo Innovation Garden by Henry Rimminen, (Ph.D. in electronics) as his own development project aiming in bringing to consumer use something that has only been available in laboratories. The original designer Vesa Nilsson has made the form that is sleek and attractive. “Moodmetric was invited to participate the Nordic bloggers´ experience, where travel bloggers around the world saw the best of Finland. The Moodmetric Ring was used to measure how wilderness affects the mood during the Winter Fun track organized in Nuuksio National Park. Forest is the best gym! We exercised a bit and then lied down on the snow on hiking mats. Staring at the white trees above us was unbelievably relaxing. One participant got a reading of 4 on the Moodmetric 0 to 100 scale, indicating a very calm mind,” adds Venho. There’s good news for those not able to reach nature - the Moodmetric app helps the wearers to find relaxations technique best fitting them. Whether it is a walk outside, mindfulness or meditation session, calming the mind brings the nervous system back into balance. The Moodmetric ring and the app are the simplest solution to manage stress and recovery. The basic model of the product is available at www.moodmetric.com – unique designs per request only.